The Fossil AM4364 Mini Flight Stainless Steel watch for women is one of the newer releases from Fossil in 2011 as of this writing. While other watches have quite a few different bells and whistles, the main highlight of this version is its simplicity and elegant look. It has a stainless steel construction for both the band and the casing, it has a handy fold over closure with push button release. It has three hands and a date display with a white face and silver color to set it off. A good choice in women's watches for a lady who knows that great looks do not always equal tons of features. Retail price for this watch is around $85. This watch from Bulova has a similar look and construction, with a bit of a difference on the face of the watch. It is made from stainless steel, and like the AM4364 it has a silver tone to the case and the band with a fold-over closing with push button release. The retail price for this watch is around $90. The Stella watch has a bit of a similar look to the AM4364 with a white and silver contrasting style. However this watch features more of a candied appearance, the main color for the band and the face being white, with silver accents. There are crystals about the bezel to set this watch off and it has three smaller displays within the face of the watch. This watch has a retail price of around $100. 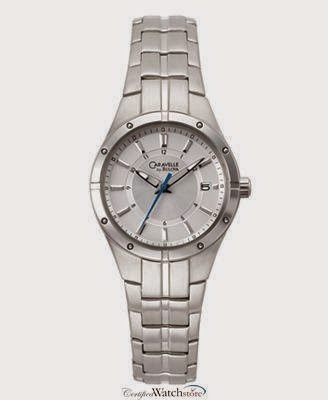 This watch from Guess is an elegant accessory that also has a silver tone created from stainless steel. The dial on this watch is mother of pearl, with crystals surrounding the bezel for a shiny and stylish look. The retail price for this watch is around $95. Fossil makes some excellent watches for women, it seems that each different timepiece is made with great quality and has its own unique look at a price that will not break the bank. The Fossil AM4364 watch for women is one of these in the lineup that has an elegant and simple style, as well as a reasonable price.